While Dr. Ho has many options to try and save a tooth, there are times when the tooth is too badly damaged or loose for it to be saved. When this is the case an extraction may be the only option. Sometimes in children their baby teeth do not fall out naturally and prevent their adult teeth from coming in. People with braces may need a tooth extracted to let the other teeth adjust into their new position, and wisdom teeth frequently need to be extracted before they become impacted or infected. No matter what the reason may be for your extraction, you can rest assured that we will take every effort to make the procedure as quick and painless as possible. At Westlake Hills Dentistry your comfort and oral health are our number one priorities. If you need a tooth pulled you may be anxious about your visit. But we want you to know that we will make you comfortable, explain the procedure, and answer any questions before Dr. Burden our Surgical Managing Dentist, begins. An x-ray of the tooth and surrounding tissue will be taken so that the doctor can see the best route for extraction. If you are having your wisdom teeth extracted a panoramic x-ray of your mouth may be taken. This gives the doctor a picture of the entire area of your mouth. The doctor will ask you about any medications you may be taking and about your medical history. Be sure to tell him about all medications, prescription and over-the-counter including supplements which you may be taking. If you are taking blood thinners or are on an aspirin regiment be sure to tell the doctor before the extraction procedure. Dr. Burden will administer a local anesthetic and a mild sedative may be used to help you relax and relieve any anxiety. If your extraction is a simple one, the doctor will be able to pull your tooth while you are under conscious sedation or local anesthetic. The tooth is loosened using a tool called an elevator and then extracted using forceps. The doctor may then pack the socket with material soaked in an antibiotic to prevent infection. Most simple extractions take only a few minutes and you are able to leave our office very soon after your appointment. If your teeth are impacted or infected, or if your tooth is broken off below the gum or has not emerged yet you may need a surgical extraction. Surgical extractions are done under general anesthesia. General anesthesia may also be used for very young children or people with behavior issues to help ease their anxiety and keep them calm. With general anesthesia you will be asleep during the extraction and you will need to arrange for someone over the age of 18 to come with you that can drive you home after your surgery. During surgical extraction the doctor may have to make a small incision in the gum line or remove part of the jawbone. Stitches are normally used to close the wound after a surgical extraction. You may also receive steroidal medication if you have an IV to help speed recovery and reduce swelling and inflammation. It is important to follow the doctor’s after surgery instructions to speed healing and prevent complications and infection. After a simple extraction most people are able to drive themselves home, but if you are scheduled for a surgical extraction it is best to bring a buddy along to drive you home. Your mouth may feel numb for a few hours after the extraction, and the pain may become more intense as the anesthetic wears off. 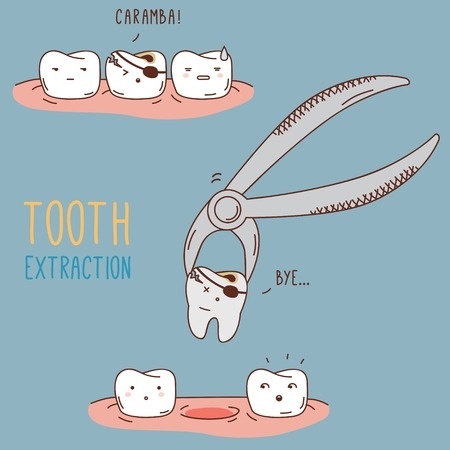 After extraction you should not brush the surrounding teeth, but you can brush the rest of your teeth as usual. Your doctor may prescribe pain medications or you can use over-the-counter medications such as Advil, Motrin, or Alleve. These are NSAID pain relievers and help to relieve pain and reduce swelling and inflammation. You can also use ice packs applied to the cheek to help relieve any pain or swelling. Pain from an extraction should start to lessen after about three days. After the extraction you should eat soft foods and rinse your mouth out with a warm salt water solution of one half teaspoon of salt to one cup of warm water. This will help keep the area clean and prevent dry socket syndrome. Sometimes the extraction area does not heal properly and the bone is exposed to the air causing pain. If you experience excessive pain after a few days please contact the office so you can come in and have the doctor check the extraction area. Most people are healed in about two weeks. Do not smoke, use a straw, or brush the extraction area during the healing process. If you had stitches during extraction surgery, they should dissolve on their own in about two weeks. Most people’s pain is lessened after about three days and healing usually takes about two weeks. If you are experiencing pain, swelling, discharge, soreness in your jaw or surrounding area after a few days contact the office for a follow up visit. Seek immediate medical attention if you develop a fever, have trouble swallowing, if the bleeding becomes uncontrollable, or if you have oozing and worsened swelling after the first 24 hours. At Westlake Hills Dentistry we take your oral health very seriously. We will take every step possible to make your extraction a comfortable and stress free experience. For more information contact Westlake Hills Dentistry today. Our office is equipped to provide an array of restorative procedures such as porcelain veneers, dental implants, composite bonding, and tooth-colored fillings.